As this was going to be my last quarter at Stanford, I made an effort towards the beginning of the quarter to decide upon classes I knew I could only take here, and one of those ended up being a class taught by BJ Fogg called “Behavior Design for Better Health”. Now I’m not a particularly health-conscious individual, and I do tend to be a bit wary of the folks who do things like quantified self, but I had heard enough about Dr. Fogg to know that this would be interesting to take. And it’s been a whole lot of fun! One of the main projects in the class is determining an “expert” on a specific “focus area”. I chose to explore the rather hot topic of standing desks, as I had the opportunity to use one this summer for the first time, and news of its health benefits have been cropping up a lot in recent days. Since there’s only 10 weeks in the class, I decided I’d want to be an “expert” specifically in getting new hires and employees at startups to adopt standing desks. I stumbled upon Customer.io CEO Colin Nederkoorn‘s guide on how to make standing desks for $22. I ended up expanding upon his guide and finding a way to reduce the price even further to $18. 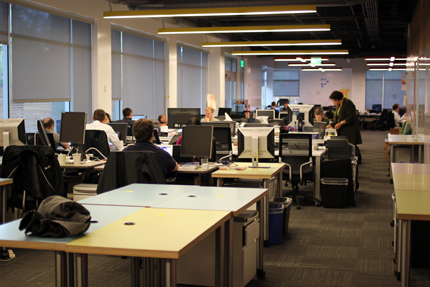 Today, I set up 3 desks at the Stanford startup incubator office, StartX. StartX just started its winter session with 15 or so startup teams, so I’m excited to see if the three standing desks end up being the domino effect that causes others to want to buy, assemble and set up their own, especially since the office space is pretty small. 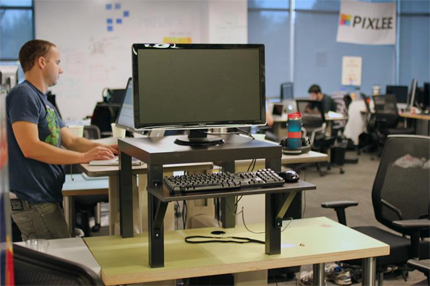 For people working at startups or founding companies, good office furniture is the last thing on their minds, especially if it’s something like a $800 Geek (adjustable) standing desk. I figure if people can see how a) cheaply and b) easily they can set these up, then they’ll start considering 1) productivity and 2) health benefits. Research from the American Cancer Society showed that time spent sitting was associated to higher risk of death, especially for women. An exhaustive study of data from 1993 to 2006 showed that women who reported more than six hours per day of sitting were 37 percent more likely to die during the time period studied than those who sat fewer than 3 hours a day. In a separate study, researchers at the Pennington Biomedical Research Center at the Louisiana State University System and Brigham and Women’s Hospital and Harvard Medical School found that individuals who sat less than 3 hours a day could add as many as 1.38 years to his or her lifespan. These are just some statistics and numbers, but it’s still pretty compelling. If you want to build your own, check out my simple SlideShare guide. This entry was posted on Sunday, December 2nd, 2012 at 5:14 am, EST under the category of Life, Oh Life. You can leave a response, or trackback from your own site.